Reporting the results of your inbound marketing efforts to your boss and sales team is no easy feat. The KPIs you normally use to measure your success, such as reach or website visits, probably aren’t the same as the ones they care most about. They need to see the direct impact of your marketing activity on their bottom line ROI. In showing the value of what you and/or your marketing team do, it’s essential to be able to succinctly report your results in a meaningful, methodical way that makes sense to your internal stakeholders. After all, how else will you prove the impact of your marketing efforts and secure the budgets you need for next quarter? Download our Internal Client Reporting Templates to use as a guideline for your monthly reports to your CEO/CFO and your sales team. To help create your reports, here are our 4 best practices for proving the value of your inbound marketing activity. This is where our Internal Client Reporting Templates come in useful. Aside from your comprehensive monthly marketing reports, you'll want to create more streamlined monthly reports geared towards your internal clients. Your C-level and sales team stakeholders are unlikely to want to see every last KPI you include in your own reports, like total website visits, leads generated per channel and email open rates. The most important metrics for them revolve around how your marketing efforts deliver results based on their specific goals. For executives, this means marketing costs and return on investment. Sales teams are usually focussed on the number and quality of leads you pass them. When you set your SMART targets for the month, quarter or year ahead, it’s important to define relevant KPIs. You can then use these metrics to measure your success against your goals, relating your results directly back to your objectives. For example, if one of your goals is to increase the number of leads generated, you’ll want to track growth against this goal. 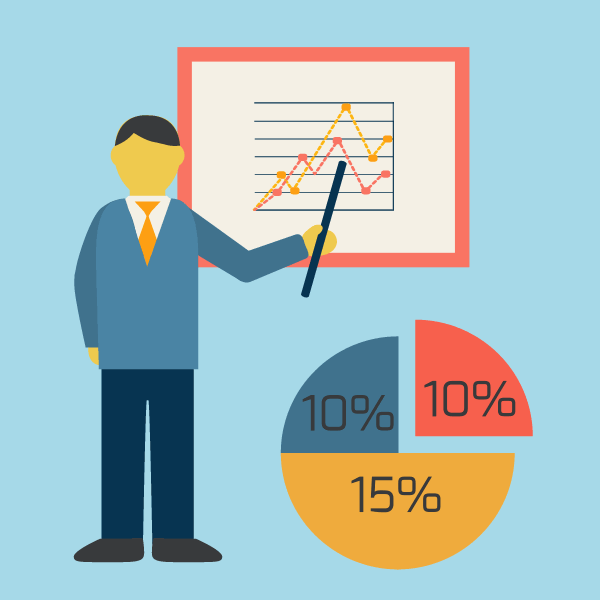 Relevant KPIs are number of visits, number of leads and visit to lead conversion rate. To measure the success of your various channels, such as organic search, email marketing and social media, you can also report the number of visits, number of leads and conversion rate per channel. Our Goal Planning Worksheet, originally part of our Inbound Marketing Planning Toolkit, is the perfect tool for setting your targets. You can use it to review your performance last year, set your next year’s goals and define the KPIs you’ll report. Ask your internal clients which metrics they need from you in order to measure the efficiency of your marketing efforts. Together, you can define the structure of the reports you provide them. Sales teams probably want to track the number of leads you pass to them, the visit to lead conversion rate, as well as looking at the best performing channels when it comes to lead quality. C-level executives like your CEO and CFO are likely to be interested in the cost per customer acquisition, as well as the proportion of that spend that is attributable to marketing. Additionally, they probably want to know the relationship between the cost per customer acquisition and the lifetime value of a customer. Download our 6 Metrics Your Boss Actually Cares About eBook for more information on the numbers that usually matter most to executives, and how to calculate them. Closed-loop marketing enables you to tie each visitor, lead and customer back to their origin; the initiative that created them. This is a surefire way to improve your efficiency as a marketer as well as to demonstrate your worth to your internal clients. Whether their initial source was a tweet, an email or a Google search, employing closed-loop marketing will track their journey from visitor to lead to customer. As well as allowing you to track your best-performing channels and opportunities for improvement, it proves the ROI of your marketing efforts and provides actionable insight on where to allocate more time and money. Our eBook An Introduction to Closed-Loop Marketing explains how closed-loop marketing works and how you can use it to demonstrate the value of your marketing activity.